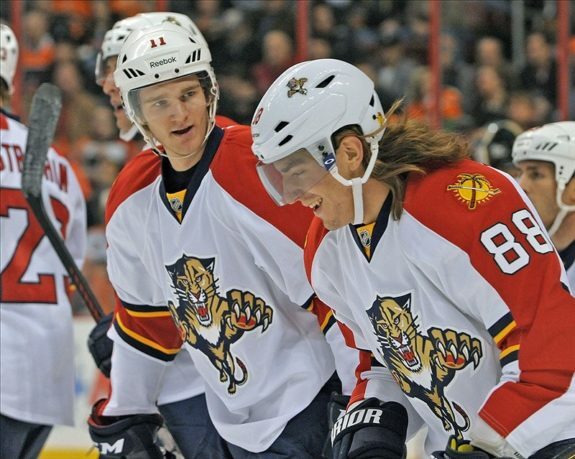 Peter Mueller: Steal of the Summer? Few heads were turned when the St. Louis Blues announced on Tuesday that they agreed to terms with forward Peter Mueller on a one-year, two-way contract. Exact terms of the deal were not disclosed. Mueller spent last season with Kloten of the Swiss-A League. He was an offensive powerhouse for the club, posting a team-leading 24 goals and 46 points in 49 games. The Bloomington, Minn. native was the then-Phoenix Coyotes’ first selection, eighth overall, in the 2006 NHL Entry Draft. He found himself on the Coyotes’ opening-day roster in 2007-08, making his name known in his rookie season. That year, Mueller posted 22 goals (second among NHL rookies) and 54 points (tied for third among NHL rookies). Needless to say, hopes were high for the elite-level rookie. Mueller became the victim of concussions shortly thereafter. In January of his second season, he suffered his first concussion at the pro level. His injury woes continued through a trade to the Colorado Avalanche, where he amassed 36 points in 47 games played, spanning over two seasons. Due to two severe concussions (and a copious amount of post-concussion-syndrome problems), Mueller was not qualified by the Avalanche as a restricted free agent, allowing him to sign with the Florida Panthers to a one-year contract in the summer of 2012. He recorded eight goals and 17 points in 43 games during the lockout-shortened season. Mueller was not re-signed by the Panthers and left for Switzerland. On the outside, this contract looks like a roster filler for the AHL’s Chicago Wolves. In recent memory, the Blues took a flyer on former 56-goal scorer Jonathan Cheechoo in 2011, only to see him score 25 goals in 70 games for their then-affiliate Peoria Rivermen while receiving zero playing minutes on the NHL roster. Considering this, Mueller’s addition looks to be a similar move to keep the Wolves competitive in the lower league. However, Mueller showed signs of life with the Panthers in his last NHL season and again in Switzerland with Kloten. He played the majority of both seasons and, last season especially, was producing points consistently. The 6-foot-2-inch forward also saw the majority of his playing time in Colorado with recent-acquisition Paul Stastny. According to Dobber Sports, Mueller spent 15.6% of his playing time on a line with Stastny and winger T.J. Galiardi, which was more than any other line combination. That begs the question, is Mueller a steal? The Blues aren’t the first to attempt to bring a recognizable name back into the limelight this summer. First, the Anaheim Ducks signed two-time 50-goal scorer Dany Heatley to a one-year, $1 million contract (after a 12-goal campaign in 2013-14 with Minnesota). Then, the New York Rangers inked speedy center Matthew Lombardi to a two-year, $1.6 million contract in mid-July (also following a season in the Swiss-A League). Contracts such as these are always low-risk, high-reward moves. If Heatley, Lombardi or Mueller don’t pan out, they can easily be put on waivers and sent back down to the AHL with minimal damages to the owner’s wallet. Mueller stands out above these other signings, though, because he is currently in the prime of his career (26-years old) and seems to be on a healthy run the past few seasons. Heatley has lost his scoring touch altogether (47 goals in the last three seasons) and Lombardi is past his prime (32-years old, entering his 12th professional season). Just like all things, only time will tell if he can even crack the Blues’ lineup, though. Currently, the Blues have 13 players on one-way contracts and two vital pieces that are either on a two-way contract, but a sure thing (Vladimir Tarasenko), or a current RFA that is guaranteed playing time (Jaden Schwartz). Needless to say, Mueller has his work cut out for him. Although Chicago seems likely for the 2007 World Junior Championship bronze medalist, he would likely be considered a prime option for a midseason call up. If he can find the scoring touch that earned him the eighth-overall selection in 2006, he could easily become that steal that other teams hope to find this time of year.